Illustrated by Miller, Tim J.
Elliott Kalan has written for the television shows Mystery Science Theater 3000: The Return and The Daily Show with Jon Stewart and the comic book series Spider-Man and the X-Men. 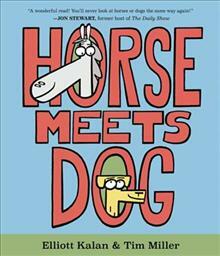 Horse Meets Dog is his first picture book. 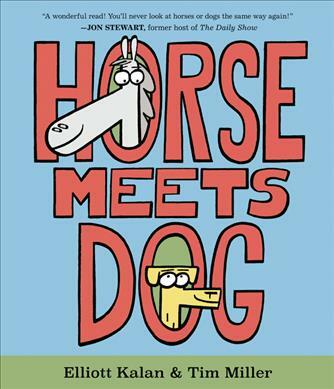 Elliott lives with his wife and young son in Southern California, where he runs the Foundation for Animal Recognition, Mutual (FARM), dedicated to finally solving the serious public problem of horse-dog meeting confusion. Tim Miller is the author-illustrator of Moo Moo in a Tutu and What's Cooking, Moo Moo? and the illustrator of the picture books Snappsy the Alligator (Did Not Ask to Be in This Book! ), Snappsy the Alligator and His Best Friend Forever! (Probably), and Margarash as well as the middle grade series Hamstersaurus Rex. Raised on a farm with cows (not horses) in Washington State, he now lives a more urban life in New Jersey with his wife and their cats (not dogs). You can visit Tim online at www.timmillerillustration.com.